As the disease spreads, olive growers in northern Puglia remain confident their trees will fare better than those of the neighbors to the south. Part 3: Can Xylella Be Stopped? CASALINI, Puglia – Deep in Puglia’s hills green with olive groves there’s no sign of trouble. The trees look healthy and are hung with strands of olives – green and black pearls. This is the Valle d’Itria, a rustic place of dirt roads, meandering stone walls, and cone-shaped structures called trulli. But not all is right. Scientists recently announced the discovery of the Xylella fastidiosa disease here – the same deadly plant pathogen strangling thousands of olive trees farther to the south in the flatter lowlands of Salento where olive groves range as far as the eye can see. This quiet corner of Puglia is now the northern tip of the deadly march of Xylella fastidiosa, a disease threatening not only this olive-rich land but the entire Mediterranean region and the rest of Europe. the European Food Safety Authority reports Xylella has been found in Corsica, the Balearic Islands and southern France. Puglia, though, is ground zero. And the next stop of this deadly march could very well be the Piana degli Ulivi Millenari a few kilometers from Casalini. If so, the disease would threaten a coastal plain north of Ostuni filled with magnificent ancient olive trees. 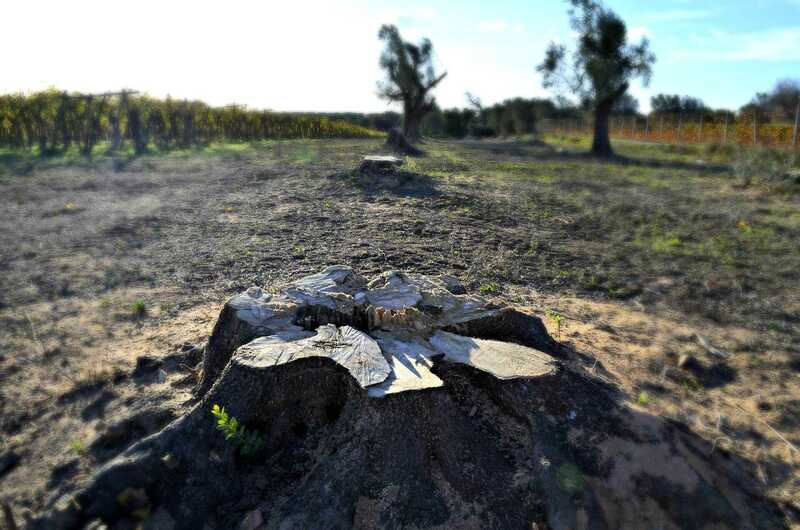 Many olive growers interviewed by Olive Oil Times did not believe the scientists and government agencies warning that the disease must be stopped – let alone with drastic measures including digging up and destroying infected trees and those close by. 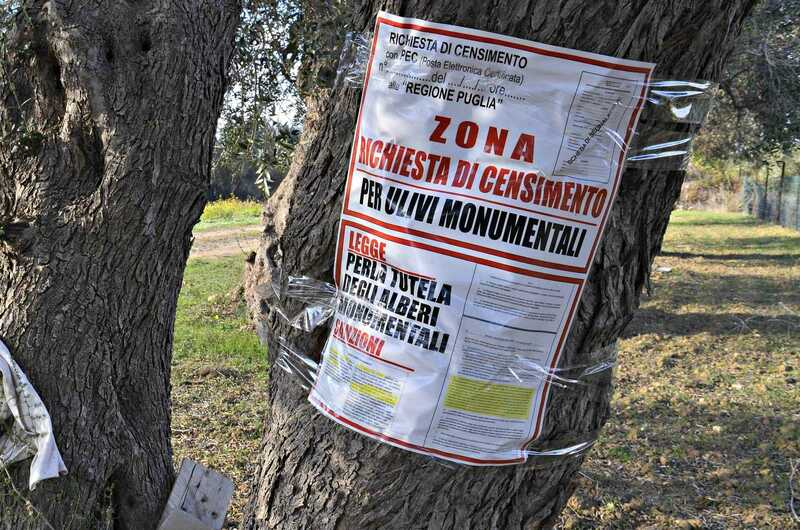 A poster is affixed to the tree requesting protection for old monumental olive trees. The area’s olive trees have been attacked by Xylella fastidiosa, a plant pathogen that scientists say is killing thousands of trees and spreading north (Photo: Cain Burdeau). One of those growers is Cosimo Epifani. 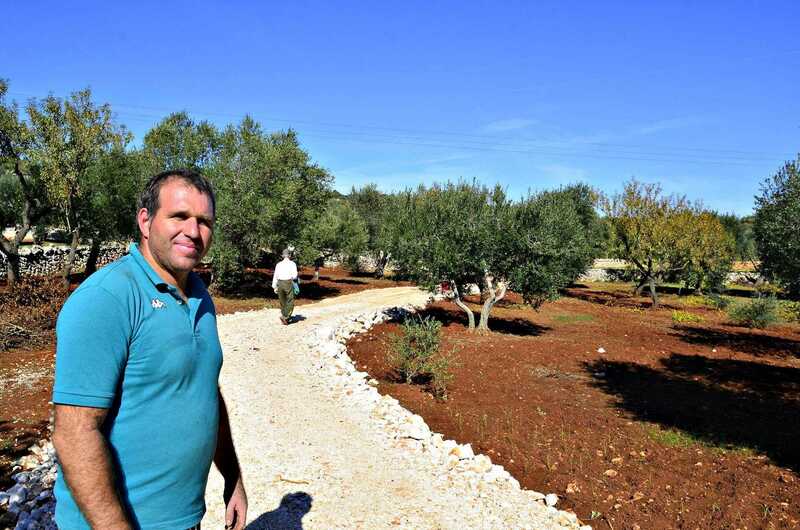 On a recent October morning, the 38-year-old was gathering olives with his family. His father was on his knees picking up fallen olives. Somewhere in the nearby groves, scientists had identified seven trees infected with Xylella, according to a regional Web site that tracks the infections. Epifani shook his head. He didn’t buy it: For him, the Xylella crisis is a fabrication to enrich scientists and others and an outgrowth of poor management of olive orchards in Salento, where trees with dead leaves – leaf scorching – were first noticed in 2010. The disease has invaded 23,000 hectares in Puglia, according to a recent study. Sitting in a car, his mother, Maria Solfatto, agreed. She downplayed the severity of the disease and believes Xylella has been in Puglia for a long time – at least since the 1950s when the region saw record snowfall. They alleged growers in Salento – where groves are large commercial operations – were at fault. “It’s because they haven’t taken care of their trees,” Epifani said as he packed up his olive picking equipment and put crates brimming with olives into a trailer. It was time for pranzo, lunch. Despite the pleas of newspapers, scientists and government officials, it’s common to hear similar arguments – and even more nefarious theories – issued from farmers and environmental activists. There are those who allege the disease was introduced by multinational agricultural corporations in a plot to force growers to buy pesticides and herbicides as well as disease-resistant olive varietals. There are those who allege developers were behind the spread of Xylella in a plot to transform parts of Puglia into golf courses and tourist resorts. There are those who say Xylella has always existed here. Scientists say Xylella arrived in Puglia with the importation of plants from Costa Rica, where the disease is endemic. This skepticism and denial are contributing to the disease’s spread, scientists warn. The European Commission has urged Italy to do more to stop the disease, which researchers say is carried by spittlebugs. There is no known cure. The misgivings of olive growers, though, aren’t just unfounded fantasies. In a strange twist, they echo allegations made by Italian authorities. In 2015, magistrates in Lecce announced a criminal investigation into whether Xylella was introduced on purpose. The magistrates have said tilling, pruning and other measures have proven effective. They also have argued that the heavy use of herbicides weakened the trees. Their investigation continues. On the edge of Salento, the tragedy of the Xylella outbreak comes into focus. Only 20 kilometers south from the green hills of the Valle d’Itria, groves near the town of Oria are under attack. In the space of two years, groves here have become a kind of war zone – a scene out of a picture book on plagues. It’s no wonder why some call Xylella the Ebola of the olive tree. Along the highway, towering olive trees are covered in brown brittle leaves. Further afield, even more groves show the tell-tale signs: dying leaves and branches. He shook his head and lamented there was no clear plan. “There are those who are treating, there are those who don’t, there are those who are doing biological treatment and that doesn’t work,” he said. For his part, he reckoned his trees hadn’t been infected because he uses chemicals to kill the bugs. “I treat the trees,” he said. Not far away trees had been cut down to stumps and completely dug up. In one grove a farmer appeared to be attempting to save trees by cutting them back drastically to the trunk and grafting on new stock, presumably to make the trees resistant to the bacteria. Some varietals are believed to be immune. At one grove full of old gnarly trees, an elderly farmer complained that authorities had deemed a few of his trees to be infected. Cosimo Epifani working with his family at his olive orchard near Casalini in the Valle d’Itria, Puglia (Photo by Cain Burdeau). He chose not to give his name because he was involved in a legal fight to save his trees from being cut down. Instead of cutting down trees, he said they needed to be pruned heavily and looked after. His farm – fenced and kept neatly trimmed and plowed – was sandwiched between groves where infected trees had been dug up. One of those trees was ancient, the farmer said. His wife showed up and spoke bitterly about government mandates to extirpate trees. She also chose not to give her name. “Italy will become a desert if they do what they want us to do,” she said. Further along the dirt road the tragedy continued. More stumps, more empty groves, more browning trees. What is the solution? Will Puglia eradicate all its infected trees and raze others to stop the spread? Will the use of herbicides and pesticides be the solution? Will heavy pruning and tilling staunch its spread? Will the introduction of predator bugs prove effective? 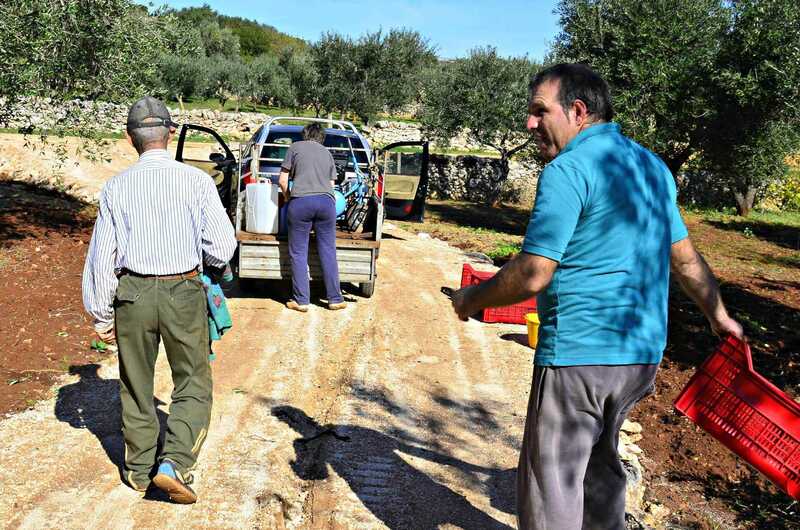 At the end of another dirt road and in the midst of a grove of beautifully twisted olives, Cosimo Albertini, an olive tree pruner and grower, came out of his farmhouse to talk. He too blamed dark forces. Asked to clarify, he stated without hesitation that he believed the disease was sprayed on Puglia.